I needed a quick dinner and had just the right ingredients on hand for a “Beef” and Broccoli Stir Fry. Of course mine will be vegan and I will use Seitan instead of beef and I will make a few other adjustments so my finished dish will be very tasty and free of sugar. Seitan is something I use on occasion, though not weekly. It is easy to make and I promise to show you how to do it sometime. But tonight I am just home from work as many of you are too on a weekday and I am using store-bought seitan. (say tan—not satan!) Seitan is essentially a wheat product in which the starch and the bran has been washed away leaving just the gluten, which is the protein part of the wheat. So you see it is a somewhat refined product and not a whole food. This is why I use it only once in a while. Yes, I’m sure some people really cannot tolerate gluten but that isn’t the fault of innocent wheat. Whole grains, including wheat, do have protein in them and we vegans eat whole grains and grain products as part of our protein intake. But some people may not be able to assimilate seitan if their system is not in a condition to do so. Gluten-free folks, please don’t get upset! You can substitute tempeh or tofu and it will be delicious especially if you do the marinating part. I’m mid-reading The China Study by T. Colin Campbell and I had a cognition about gluten based on Campbell’s expose of the shenanigans that have been going on for decades between the government, the medical establishment, the media and food industry giants to make us believe certain falsehoods about animal-based versus plant-based foods. I thought about how gluten intolerance has become a modern dietary dilema relatively recently and I strongly suspect that those promoting the evils of gluten have a vested interest in keeping the meat and dairy industries at peak profit. Coupled with the degradation of our food supply and the increasing difficulty in getting regular, organic, whole, unprocessed, un-sugared food (at least in the Western world) it is no mystery to me why many are so worried about gluten! Is it possible that if people are convinced by all the no-carb, high animal protein dietary programs around that they shouldn’t eat carbs, and if people don’t differentiate between simple and complex carbs and mostly only eat the simple, refined ones anyway, that they could reach a point where they can no longer tolerate gluten? Measurements are approximate and mostly according to your tastes. I myself don’t measure any of it. Marinate the cubes of seitan in the soy sauce, rice vinegar, mirin and chili pepper flakes. This will be a strong mixture and you need it strong in order to get enough flavor into the seitan. Let the seitan marinate while you prepare the rest of the ingredients—or at least a half hour. Wash and cut the broccoli florets. Try to make them about the same size so they will cook in the same length of time. Trim the outer layer of the broccoli stem and discard. (These tend to be too tough!) Then slice the stem in diagonal 1/4 inch thick slices. Broccoli stems, by the way, can be very sweet and delicious! Dissolve the kuzu in water and set it aside until you are ready to make your thickened sauce. Begin the stir fry by heating up your oil in a wok or low, wide pan—medium high flame. Saute the broccoli stem pieces for a minute or so and then add the florets and a pinch of sea salt. Next add the mushrooms, another pinch of sea salt and the ginger and stir fry until the veggies are cooked but still a bit crisp. Add the seitan and the garlic. As the seitan is already cooked, it just has to heat up. If you like a milder garlic taste, add the garlic in the beginning so it cooks more. When everything is done, add the marinade and the kuzu dissolved in water. Keep stirring as the liquid thickens and will take on a glossy appearance. If there isn’t enough sauce, just add more of the liquid ingredients and use more kuzu dissolved in water. This will depend somewhat on whether you’re serving the stir fry over noodles or rice or just eating it by itself. 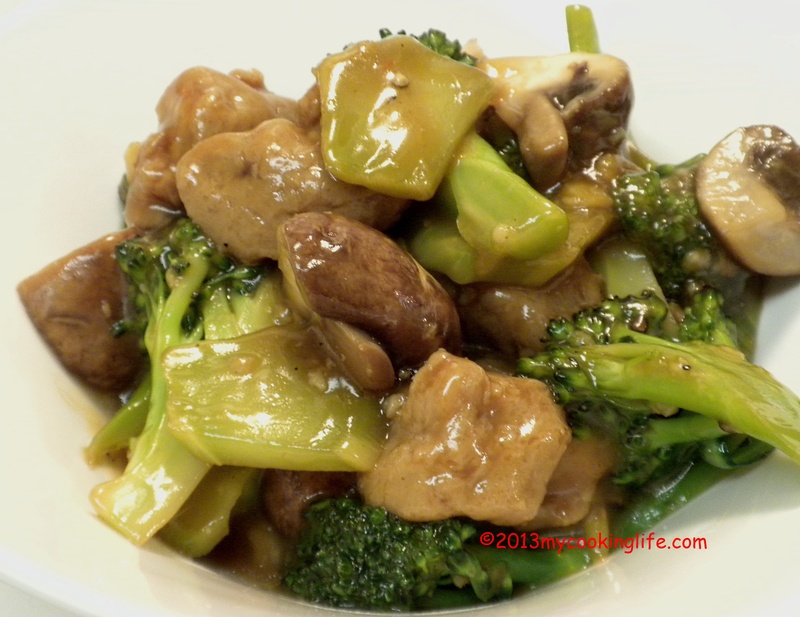 This entry was posted in Uncategorized and tagged Beef and Broccoli, China Study, Gluten, seitan, stir fry, T. Colin Campbell, Wheat gluten (food), wheat meat by mycookinglifebypatty. Bookmark the permalink. Super yummy looking, Patty. I shall make this. Have made other similar recipes, but yours looks really good. I have never made seitan from scratch, but have happily bought it at the co-op for years. Thanks Kathy! It was good and my Hubbin’ ate it all up in one sitting! I have gotten some feedback about people wanting to know how to make seitan. I going to have to write a post about that I think. Very interesting! Most people are completely misled about what % of their diets need to be protein and don’t know that a plant-based diet has plenty of protein. What a cool picture – Thanks! this looks delicious, I’ve never tried kuzu, I’ll have to find it. And I’d love your recipe for homemade seitan. I totes agree with everything you said about how we’re manipulated. Thanks! This particular seitan is store-bought and I just put it in the stir fry. But I will do seitan “from scratch” someday for a post. As for maniuplation, this is really just one area where we are treated like idiots.